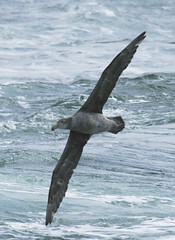 The species is the largest of the (mostly much smaller) petrels, sometimes mistaken for a small albatross. THey are important scavengers, feeding on carcasses of penguins (as on the picture), other birds and seals. Many of them are annually dying as they are caught on the hooks of long-line fishing boats. The polar and high mountains are the planet’s barometers, telling us a great deal about the present and future effects of climate change.